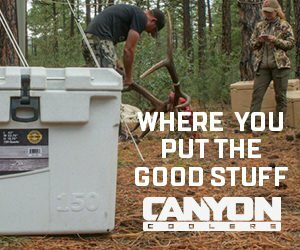 Getting good sleep on extended hunts in the backcountry is vital, but making this happen, can be tougher than you think; rocky ground, cold nights and rain storms are just a few of the issues that you will be facing in the wilderness. 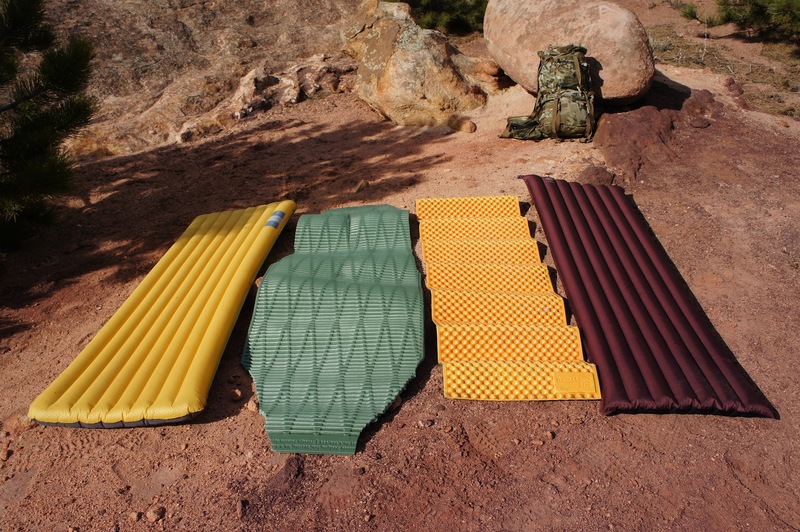 The backpacking world has so many options for sleeping pads that it can get down right confusing, and purchasing the right pad for your particular hunt, is going to depend on several things. To simplify your decision, we asked Rokslide staff members Luke Moffat and Aron Snyder to give you their views on sleeping pads and what models they prefer in different situations. There are times when the choice of sleeping pad can make or break a hunt. As everyone knows, getting quality sleep in the backcountry not only enhances the experience, but also helps you to better perform. I use both air pads and closed cell foam (CCF) pads. Both serve a purpose and there are times I use them in conjunction with each other. For me, a CCF pad is more utilitarian. They are harder to destroy in the backcountry, which is often a good thing. A CCF pad also only has to be unfolded or unrolled, so they pack and unpack faster. Also, a CCF can be used as a seating bench for you and a buddy while sitting to glass on the cold ground or snow. Another advantage to CCF pads is that they are generally lighter than an air pad of equal R-value. 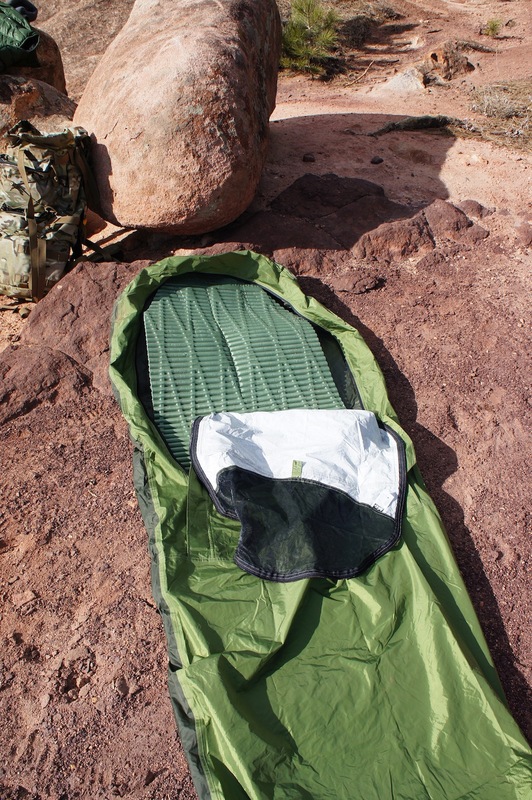 An air-sleeping pad such as one that only uses air to get you 2+ inches off the ground is more of a luxury item. Often these pads weigh in at 1.5 to 2.5 pounds, which is quite a bit more than their CCF counterparts that often are 1 pound or less given the same R-value. The advantage?? Well, as stated above, you are now 2+ inches off the ground sleeping on a cloud. For many, myself included, there are times when this small weight penalty is more than worth it for the quality sleep they provide. One disadvantage to air pads is that they can be popped. Though I have a couple hundred nights in the field with a couple different style air pads and yet to have a failure of one “popping”, the potential is always there. If going on a quick solo hunt I’ll talk a simple 8 oz, ¾ length CCF. If going late summer or early fall, I’ll often take a 9 oz, ¾ length air pad with very little R value but also haul a ¾ length CCF. The CCF serves as a glassing bench during the day and then is folded in half at night to provide my legs with the last bit of support so I hardly miss my full-length air pad. Late fall or winter I’ll often take a heavier, 23 oz air pad that has a very impressive R value, as well as bring along my trusty 8 oz CCF pad. Insulation from the ground is crucial to staying warm and thus a good quality night’s sleep. I have found the lightweight air pad in conjunction with a lightweight CCF to be the most versatile setup for most backcountry trips I take these days. It provides a lot of insulation from the ground, as well as giving you more versatility in putting the CCF in your daypack to use for an unexpected night on the mountain, or better yet, a nice seat around camp or when glassing. Obviously, there is no one solution for everyone’s needs and applications. The above is what I have grown to like over a couple hundred nights in the field over the past few years. Much like Luke, I have used just about every pad on the market today and have narrowed my options down to two different models. 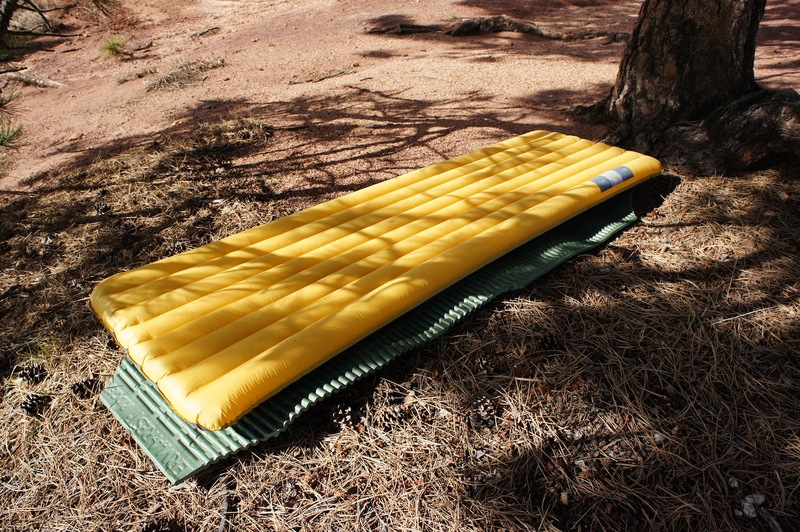 The Exped SynMat UL 7 (Air Pad) and the RidgeRest Solite from Thermarest (Foam Pad). With these two pads, I can handle just about any sleeping situation in any conditions with a relative amount of comfort. When going ultralite into rough country, I bring the RidgeRest as my stand-alone pad, sacrificing a little comfort, but dropping a few ounces of pack weight and adding an extreme amount of durability compared to the air pad. The RidgeRest is a bit more user friendly since you only have to unroll and roll it up when unpacking or packing camp. I actually trimmed a bit of extra material off of the RidgeRest to help conform it to my bivy sack; doing this, allows me to have my sleeping bag and pad inside the bivy sack at one time with total protection. An extra bonus of a foam pad is that is serves double and triple duty most of the time, giving me a cushioned pad when glassing and also a place to sit when hanging around camp. This can’t be done with an air pad because of its fragile nature. After the trimming was complete, my personal RidgeRest (large/77×25), weighed in at 11oz’s, but from the factory was just over 16oz’s. The Exped SynMat UL7 is within a couple ounces of the RidgeRest in weight, but you are going to give up a lot of durability with any an air pad when getting into that 16 oz weight category. With the somewhat fragile nature of the Exped, I will only bring this as a stand alone pad when sleeping in a regular tent and the possibilities of a bivy trip are not on the horizon. The Exped is 2.8 inches thick and weighs just over a pound, so the comfort and weight it delivers is pretty hard to pass for most backpack hunters. When I’m heading out to an unknown area, or cold weather is in the forecast, taking both pads is an easy choice. Sticking the RidgeRest under the SynMat will give me all the protection I need, but also increases the R-value of the pads when used together. Using both of these in conjunction does have a down side, giving me a total weight of 28 ounces in the pack, but the extra weight is usually worth carrying for the added bonuses this combo brings to the table. I spent over 120 nights in the wilderness last season and the foam/airpad combo was used 80% of the time. One thing that Luke and Aron both agree on with sleeping pads is the fact that you can’t find 1 pad that’s perfect in every situation and you should err to the side of caution when heading into the backcountry. Luke was born and raised in Alaska. He grew up mostly in the interior of the state where his love for the outdoors really took off. Being able to hunt big game like caribou, moose, grizzly bear, and sheep literally out the backdoor of his house, spoiled him more than he realized at the time. Growing up in a rural town in Alaska left a lot of opportunities for adventure, usually as Mt. McKinley loomed in the background. When not spending time outdoors, he works in the oil field on the Arctic Ocean. This job allows him to have large blocks of time off for outdoor activities. Living in Alaska, he is lucky enough to be able to hunt black bear, brown/grizzly bear, dall sheep, caribou, moose, mountain goat, and Sitka Blacktail deer annually without drawing any permits. 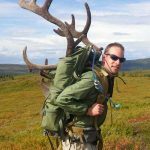 Whether it be snowmachining (snowmobiling for those in the Lower 48), hunting, fishing, backpacking, or, packrafting, he is blessed to be able to spend nearly 100 nights in the field each year usually accompanied by his lovely wife Becca.